“I say without hesitation, that motorcyclists love the mountain. It is where we dance. We freely fall into gravity’s demanding arms then with a twist of the throttle are thrust into the next delicious curve. A graceful ballet of endless pirouettes lifting the spirit as we ascend, as we transcend, riding high, above the mundane until among the stars we fly. And the mountain is where we fight, wrestling perilous hairpin turns, battling hard against opposing forces, often for our life. Because if the mountain wins…we die. At 35,000 feet on twenty-hour flights, one finds ample time to wax poetic, time to ruminate over the sheer magnitude of the highest mountain in the world. Contemplating the scales balancing human experience between earth and heaven’s ceiling, or the gyroscopic forces that balance motorcycles between your legs; it’s cold and lonely at altitude and those fearless few who attempt the Everest ascent every year know that more than anyone. At a permit cost of $45,000 to summit Everest, it’s a very serious undertaking, for us motorcyclists, Himalayan Roadrunners– all will ascend to nearly eighteen thousand feet and view Mt. 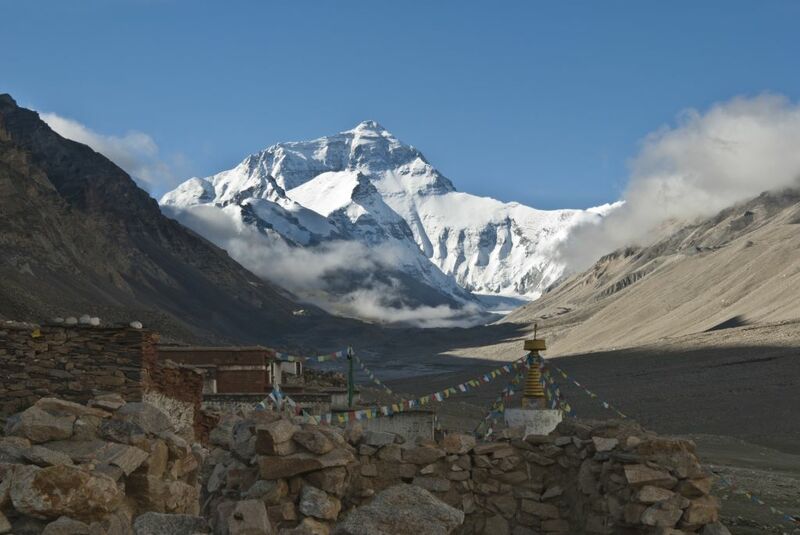 Everest from the highest Tibetan monastery in the world.